Digital commerce is changing consumer behavior, so you have to make sure your retail associates are not left behind delivering the same old anonymized and uninformed customer experience. 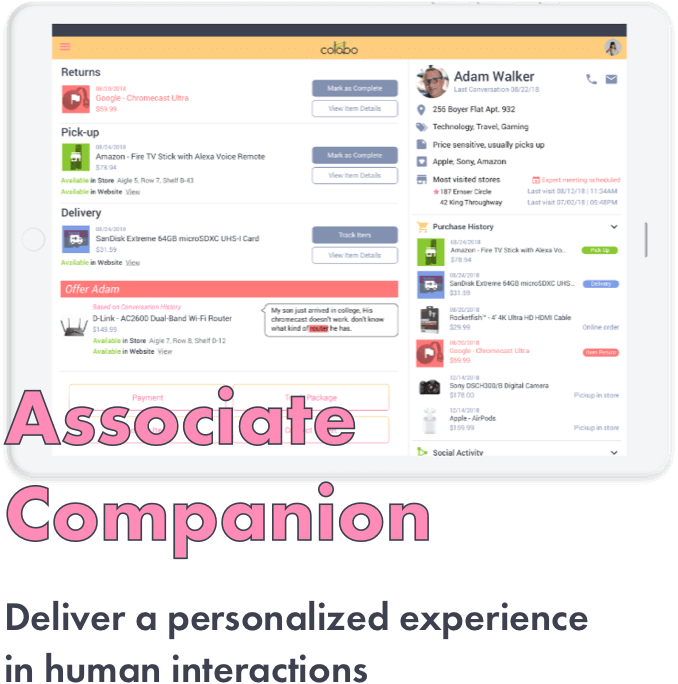 Colabo’s Associate Companion is a mobile solution that assures your associates know everything they need in order to provide the best experience for the customers they are facing. From Information about the customer such as purchase history, household information and color preference to automated product recommendations. Accessible on every portable device, the retail sales companion is an app that makes the employees smarter about the products and services offered, maximizing the encounters on the sales floor. Be it the technical details of a popular video console, summarized reviews of the trendiest beauty products, product comparison or access to fulfillment and support options, utilizing the companion at your stores benefits the associate and the customer alike.